I am always looking for delicious fruit recipes for my family. 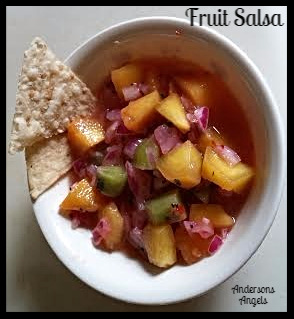 The newest creation I made my family was a delicious Peach/Kiwi fruit salsa. Combine the onion and lime juice in a large bowl. Add fruit, pepper flakes, garlic, cilantro and orange juice. Stir together and chill for 2 hours. Store covered up to 2 days. We have eaten this salsa with rice chips and pound cake. I'm not sure if my boys would like this, but it definitely sounds delicious to me! I love chunky salsa, but I've never had a fruit salsa. I bet I'd love it with pound cake! This looks amazing. I can hardly wait to try this one! This is really different. I can tell from the ingredients that I would love it. Thank you for the recipe! Looks delicious I'll try this soon. I can't wait to try out your special recipe for this Peach & Kiwi Fruit Salsa. I think it sounds delicious, and I hope I do as good as you did in the photos. Looks delicious I'd love to try this. This sounds like a unique and yummy treat! Can't wait to try it! Thank you for sharing. I have never heard of this one but it looks delicious. I'm not a huge fan of fruit in salsa. My FIL makes a mango salsa that everyone loves and I'm always the odd man out. I am trying this soon. I love the mix of sweet and tangy.